Sir Alex, Pep & Mike Bassett: Tactics gods or top shouters? The Sir Alex Ferguson or Mike Bassett approach to management? Is Sir Alex Ferguson a tactical genius or just a very intimidating man and accomplished shouter? When he introduced Teddy Sheringham and Ole Gunnar Solskjaer to win the 1999 Champions League final against Bayern Munich, most seemed to agree it was the former. Incredibly, both scored during injury time to send the cup back to England and leave Samuel Kuffour famously beating the turf in frustration. To add to the Manchester United manager’s fittingly Germanic-themed schadenfreude, the switch was later voted the best-ever decision in sport. But weren’t the substitutions pure common sense? And besides, surely Barcelona’s decision to sign this little fella trumps all others? There’s clearly a bit more to the tactical side of football than complete luck or coincidence. But it hasn’t always been about deeply entrenched plans or philosophies, as noted historian Jonathan Wilson observed in his tactics bible Inverting The Pyramid. “In the beginning there was chaos, and football was without form,” he wrote. As the modern game started to find its place on a global stage, attempts were made to streamline the movement and decision-making of the players. Initially, it seems most managers had their tactics board permanently upside down. The earliest documented formations can be traced back to 1872 and the first international match, when England took to the pitch in a forward-thinking 1-2-7 and Scotland in a marginally more conservative 2-2-6. How would this look today? Insane. A number of tactical ideas and concepts have since held sway but it’s possible to highlight a handful of truly influential strategies that have changed how football is coached and conceived. In 1925, the FA’s decision to change the offside rule meant attackers required two players rather than three between them and the opposition goal. In recognition of the added vulnerability this imposed upon the defensive team, Arsenal manager Herbert Chapman created his “WM” formation, innovating the counterattacking style that still lands knockout blows to this day. In 1931, his title-winning side scored a remarkable 127 goals, one short of the English league record, set in the same year by Aston Villa. Hungary’s 6-3 shellacking of England at Wembley in 1953, where the home team had never been beaten, confirmed the arrival of a magnificent side that lost just once between 1950 and 1956. It also confirmed a pioneering approach to positioning, founded upon fluidity and flexibility, that floored opponents. Equally, the Brazilian team that won its third World Cup in 1970 can be considered remarkable for many reasons but mostly because they played with such flair. 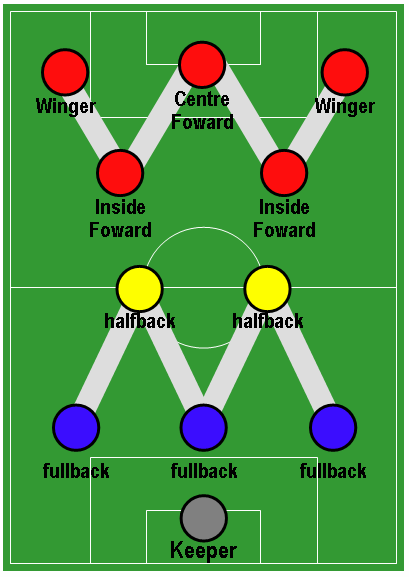 Taking the tournament in Mexico by storm, Mário Zagallo’s 4-2-4 formation included “the five 10s”, all creative playmakers: Pele, Gerson, Tostao, Rivellino and Jairzinho. Winning seven matches in a row, they also scored what is perhaps the greatest goal the tournament has ever seen. Rinus Michels, the Dutch architect of “Total Football”, is another footballing revolutionary, having masterminded the pressing and counter-pressing system which saw his Ajax and Netherlands teams “hunting in packs and defending on the halfway line”. Arguments rage about the true origins of the press but Russian manager Viktor Maslov is credited with inventing the technique while in charge of Dynamo Kiev in the mid-60s. Meanwhile, Italian football will forever be associated with the “catenaccio” (door bolt) defensive style that was devised by Austrian coach Karl Rappan, popularised in Italy by Nereo Rocco and then perfected by Argentine coach Helenio Herrera with Inter Milan. Deploying a “libero” (sweeper) behind the back four and “trequartista” further forward, literally as a footballing fantasist, the emphasis was on military-style marking, aggression across the pitch and defensive unity at all costs. Actually, the emphasis was arguably win at all costs, as reports and footage from Inter’s infamous 1965 European Cup semi-final against Liverpool underline. Approaching the modern day, Pep Guardiola’s Barcelona won a staggering 14 trophies from 19 competitions between 2008 and 2012. The phrase “tiki-taka”, said to have been named after a Spanish juggling toy, was reportedly used for the first time publicly by Spanish broadcaster Andrés Montes at the 2006 World Cup. “Estamos tocando tiki-taka tiki-taka,” he said when describing the national team’s intricate passing style. At their peak, Barcelona were capable of dominating any opposition, claiming 81% possession against Inter in the 2010 Champions League semi-final, allied with a high pressing line, fluid positional interplay and masterful technique imposed by Guardiola and former coaches Johan Cruyff, Louis van Gaal and Frank Rijkaard at the club’s La Masia youth academy and across the club. The results were truly incredible and frequently mind-bending. How has British football adapted to these ideas and the constant expectation to evolve? Badly, to be frank. Since the 1966 World Cup victory, England’s performances on the national stage have becoming increasingly abject, displaying a tactical inflexibility and ball-phobic strategic vision that reached its nadir at Euro 2016 against Iceland, a country with more volcanoes than professional footballers. The nation looked away as one every time Harry Kane, the latest great white hope to be haunted by the ghost of Geoff Thomas on the world stage, stepped up to thrash at a set-piece. In an attempt to explain the chasm that exists between the national mindset and that of our European contemporaries, Jonathan Wilson surveyed the footballing landscape across the previous 100 years and noted that the English have “proved themselves unwilling to grapple with the abstract”. While elsewhere in Europe, at the coffee houses of Vienna, Budapest and Prague, “intellectuals and their acolytes would discuss the great affairs of the day: art, literature, drama and, increasingly in the 1920s, football”, we have been too busy boozing, swearing, fighting and obsessing over “4-4-f***ing-2”.